With the fat beats of the Chemical Brothers’ ‘Hey Boy Hey Girl‘ fading out, veteran startup doyen, Walter Herriot, looked like he’d taken a substance or two himself as he bounced on to the stage with greater animation than normal for the introduction of Anglia Ruskin University’s Big PitchFinal. Stopping just short of doing the running man across the floor, Herriot helped build a lively atmosphere out front while the pressure mounted backstage, but not just for the finalists. 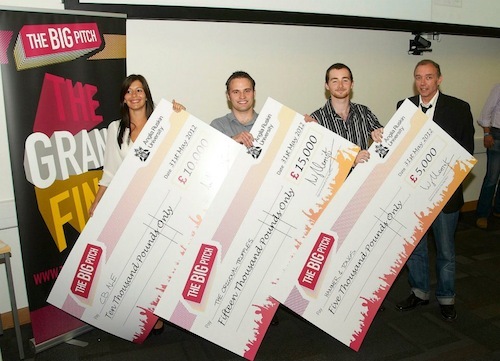 The competition is now in its second year and part of a wider push by Anglia to build a nationally recognised startup culture: the Big Pitch needed to justify the £30k on offer by showing last year’s strong performance was not just a flash in the pan. On numbers it has been up to the task with 64 video entries, well above the previous year. Thirty two were shortlisted compared to 20 in 2011, half of them chosen by popular vote on a web site that attracted almost 17,000 visits and over 4,400 votes. The 32 shortlisted ideas were whittled down to the seven that pitched last night in pursuit of a cut of the prize money, this year split into £15k, £10k and £5k awards for first, second and first. Unlike last year when four of the seven finalists were web-based ventures including all three eventual winners, this year only a Skype-based language web site (LiveTalk) came close to being a ‘digital’ business, which will surely be welcomed by non-tech entrepreneurs and Herriot who has consistently spoken of the need to ‘democratise’ startup competitions. LiveTalk didn’t place in the top three however, those were taken (in descending order) by The Original Truffles Company, CB Ale and Hammer and Tongs. The charismatic Laszlo Csiba was the one pitch with more bounce than Herriot. His business is based on his own passion for truffles – I know how to make the customer happy – as well as a source for a range of truffle based products from his home country, Hungary. With the UK increasingly opening up to new and more sophisticated foods, by tilting at everyday consumers, Csiba seems to have identified a market opportunity and is already selling in Cambridge on weekends. The judges suggested he develop a well thought out marketing strategy on an already strong brand, but it was the force of personality, a deep understanding of his product and a natural sales patter that surely clinched it. I have experience in catering, ordering, preparing and serving food, but most importantly, I know how to make the customer happy, said Csbia, who convincingly outlined how he would help people slow down and enjoy the good things in life, such as his truffle products. Csiba says he plans to use the money to upgrade his distribution equipment and partner with a soil and water engineer on an East Anglian truffle production project. Second placed Paula Albiñana also has an existing product, a low-alcohol beer aimed at women that sells in pubs in Cambridge. Another strong pitch, the story behind Albiñana’s CB1 beer sounds like something straight out of Hollywood. Albiñana’s grandmother came to the UK in 1940, fell in love with a brewer and produced a beer to impress him. Unfortunately he died and she returned to Spain. The grandmother’s dream came back to life however when Albiñana came across her diary however, found the recipe and recreated it. Again, and ability to sell and passion stood out for the judges with Paddy Bishop in particular suggesting that the product stands a strong chance of success as long as it is able to transition from a beer on tap to a bottled product. Third placed Hammer and Tongs delivered something quite different to the warm attractive offerings of the first two winners. There was nothing cuddly here, no big doe-eyed web icons, Hammer and Tongs Productions is a social enterprise that works with ex-offenders through music, drama and film making. The inevitable question was where’s the money going to come from? One answer is government, another is philanthropy, but something more sustainable in the same vein of Ipswich’s Red Rose Chain was suggested. Hammer and Tongs is looking to distribute films such as ‘The Crack’ and new documentaries. The money will also help with this summer’s planned production of Charles Dickens’ tale, Oliver. It’s difficult to imagine Hammer and Tongs or any of the other winning companies starring at any of the other Cambridge startup competitions. We’ll see whether it’s a permanent trend next year as The Big Pitch confirmed it will be running in 2013.